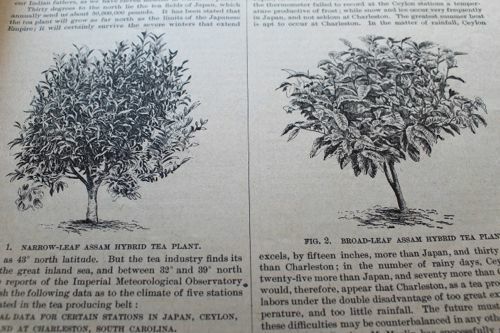 It is always fun to learn something new about the history of tea in America, so I am absolutely delighted with an item I recently purchased online, this August 1893 issue of American Agriculturist magazine. 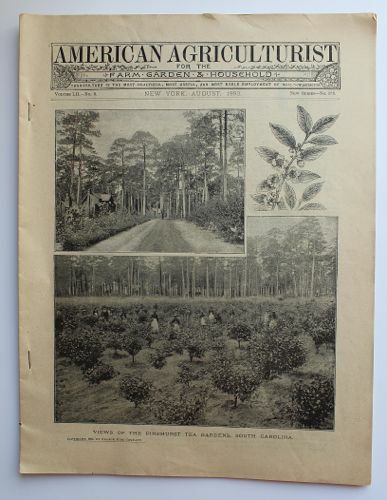 The cover features images from Pinehurst Tea Gardens in Summerville, S.C. and an article by Dr. Charles Shepard, its founder. 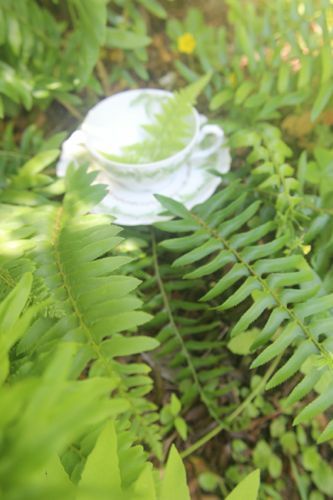 If you've ever visited the Charleston Tea Plantation at Wadmalaw Island, S.C., you may have learned that tea plants from Pinehurst were eventually transplanted to the Charleston Tea Plantation. 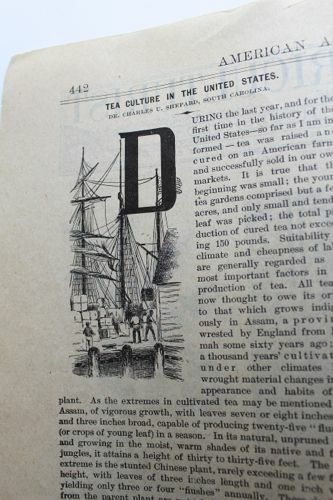 Shepard's article is titled "Tea Culture in the United States," and it begins, "During the last year, and for the first time in the history of the United States—so far as I am informed—tea was raised and cured on an American farm, and successfully sold in our own markets. It is true that the beginning was small; the young tea gardens comprised but a few acres, and only small and tender leaf was picked ; the total production of cured tea not exceeding 150 pounds." The article includes an in-depth discussion of climate conditions in tea-growing regions around the world and provides several charts of high and low temperatures in these places as well as rainfall amounts. Shepard notes that the quality of tea grown at Pinehurst in the recent growing season has received favorable reviews. "Thus far," he says, "only Assam hybrid leaf has been picked at Pinehurst; and it is better adapted for the manufacture of black or fermented tea. 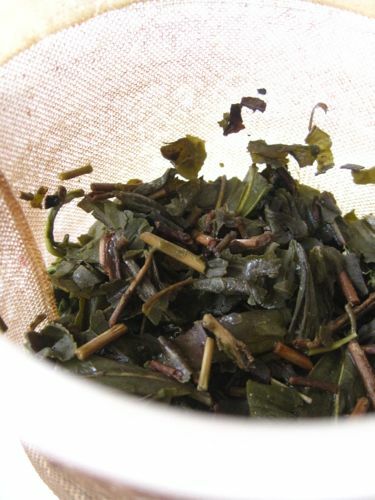 But this season some Chinese and Japanese plants should be in a condition to furnish leaf for experimentation, and it is not improbable that green and oolong teas similar to the Chinese may be made therefrom. 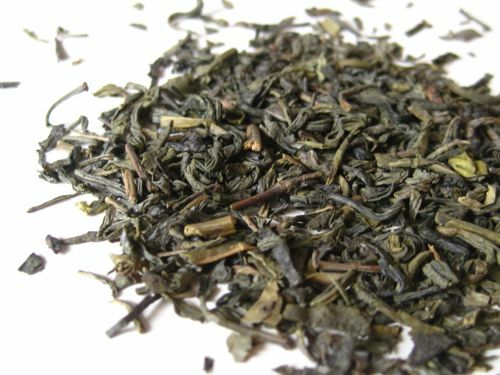 Should this leaf prove adapted to this product, the great host of American green tea drinkers may be supplied absolutely pure and American tea to their liking." Shepard died in 1915, and according to the Charleston Tea Plantation website his plants grew wild for the next 48 years. They were transplanted to Wadmalaw Island in 1963, eventually becoming part of what we now know as the Charleston Tea Plantation. 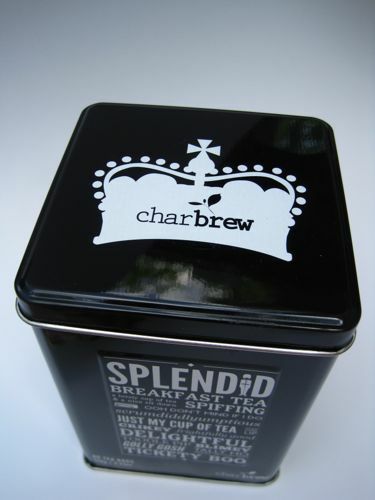 This stylish tin of Charbrew English Breakfast Tea was a gift from my friend Maureen, and I was happy to try it because this was a new name in tea to me! According to the Charbrew website, "Charbrew Breakfast Tea is made with (a) full bodied blend of the finest broken Orange Pekoes from renowned estates in Ceylon." I had a feeling this would be a brisk blend, since those are the ones usually favored by Maureen, and indeed it was. 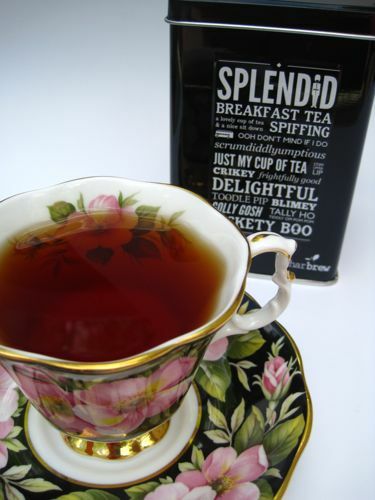 I do love a nice, refreshing Breakfast Blend, and this one had a very rich, smooth taste that I greatly enjoyed. 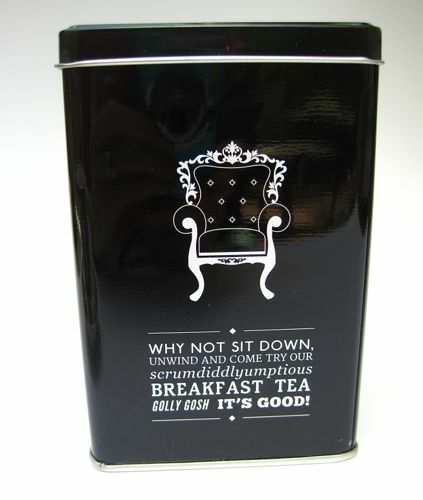 And I also enjoyed the clever tin! "Ladies and gentlemen, we'd like to welcome you here today to our first annual Tea With Friends Floral Fashion Show! Our models are a delightful group of absolutely lovely and talented teawares, and we know you're going to enjoy seeing them as they model the newest spring fashions. 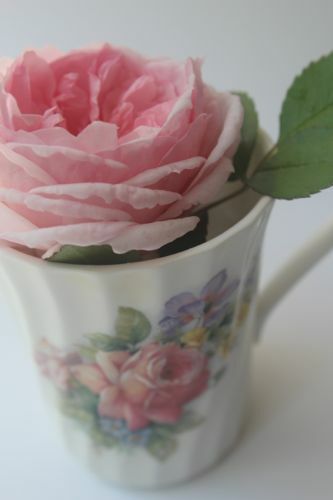 First up, we have a Royal Patrician bone china mug sporting a fabulous new rose design. Miss Patrician, tell us, who are you wearing today?" 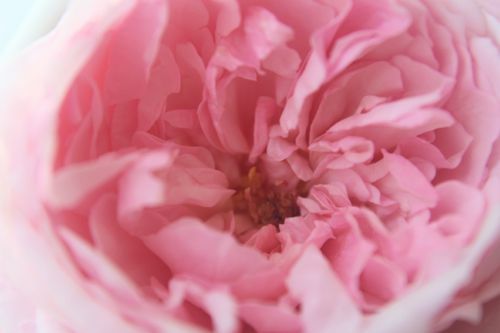 "I'm wearing Wedgwood Rose by David Austin. The blush pink color accents my figure beautifully, and Austin designs, as you know, are simply classic." "So, so true! Thank you very much, and who is that there at the back of the stage? Why, I believe that's our German teacup model, isn't it? Why yes, it is, and who are you wearing today, miss?" 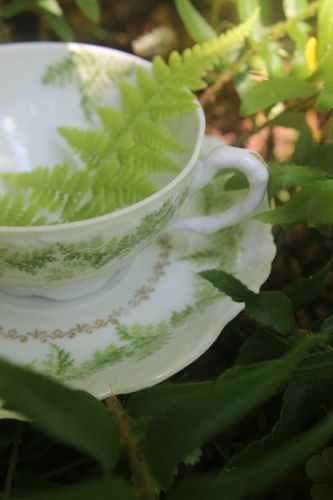 "I'm wearing a variety of fern designs, a classic motif in spring and summer fashions." "Stunning, and so very elegant. Well done. 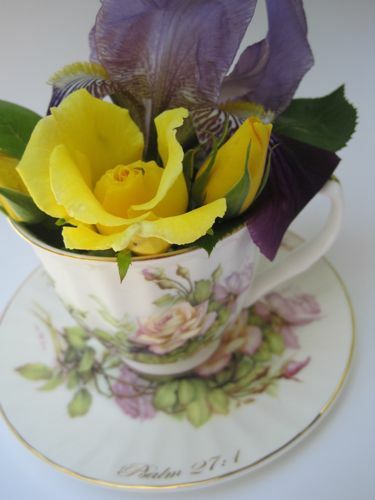 And now we have another member of the Royal Patrician Dynasty, this time with a tea rose in yellow and a lovely purple iris. I also see you have some script on your teacup outfit. That's very on-trend right now, you know. What does that say?" "Oh, it's a verse from the Bible, Psalm 27:1, and says 'The Lord is my light and my salvation.' And as you know, none of these designs would be here today without this light." "Simply amazing, such grace. And would you look at all these details?" "This Designer always delivers the most exquisite pieces, year after year. You can't help admiring the radiance of this one." 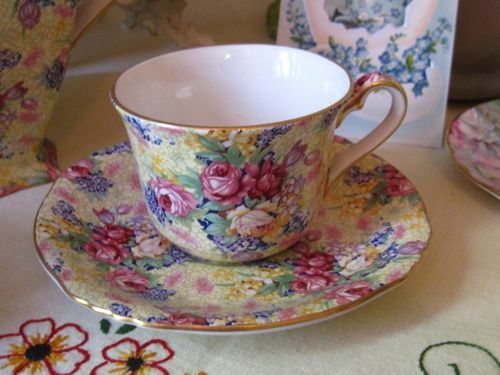 "And on a more casual note, we have this model from Old Royal Bone China. I must tell you, you don't look old at all. What's your secret, and who are you wearing today?" "Good bones I suppose. And believe it or not, I'm wearing a design of Wild Strawberry Flower." "Wild Strawberry Flower? It's amazing what makes it into these fashion shows each year. And finally, ladies and gentlemen, we end today's show with this model, Miss Royal Vale from Ridgway Potteries. Somehow she makes it into the spring shows year after year after year. And who are you wearing today, Miss Royal Vale?" 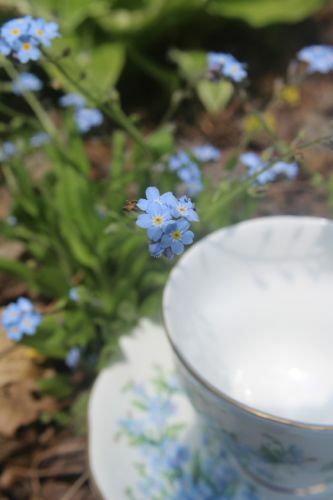 "I'm wearing Forget Me Nots, just as I shall every single year." "Ah, yes, of course! Just gorgeous. That's a great color for you. And that concludes this year's program, ladies and gentlemen. We certainly hope you've enjoyed our show!" 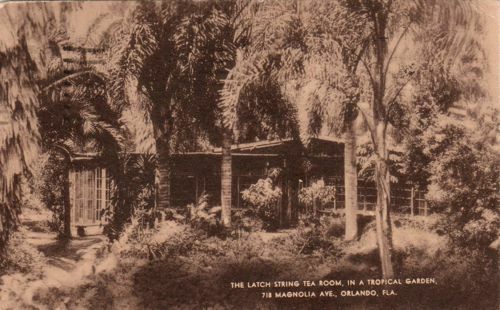 When I think of Orlando, Fla., I must confess that the Latch String Tea Room is not the first thing that comes to mind. 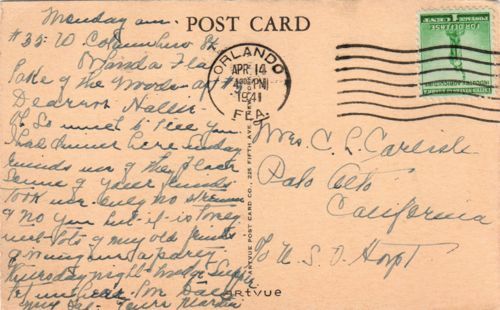 This postcard states that the tea room is "in a tropical garden," and I kinda sorta think I would have figured that out from the photo on this 1941 postcard! The back of the card, well, I'm going to need some help with this one. "Monday a.m. #35:20 Columbus St., Orlando, Fla. Lake of the Woods, Apt. # (5?) Dearest Hollis - Oh so sweet to see (?) you. I had dinner here Sunday. ? was of ? ? source of your friends. Took us over no ? and no you but it is lovely ? - lots of my old friends something-something a party. Something night and had something supper and ..." Well, shoot, I give up. I've had it with this postcard. I can't even read the signature, and I feel right sorry for Mrs. C.L. Carlisle, the recipient. Anyone who's good at translating old handwriting, please feel free to give it a whirl! Erin S.! And bless you for including your e-mail address, as I have just sent you an e-mail so I can get your mailing information. Congratulations! 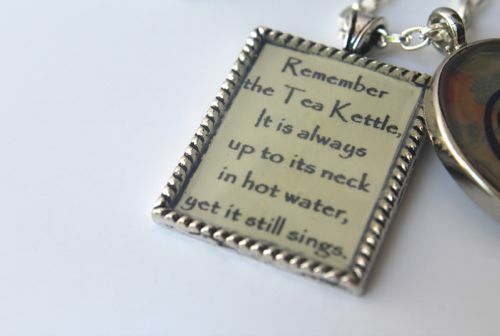 This charm features the popular tea quote, "Remember the Tea Kettle. It is always up to its neck in hot water, yet it still sings." 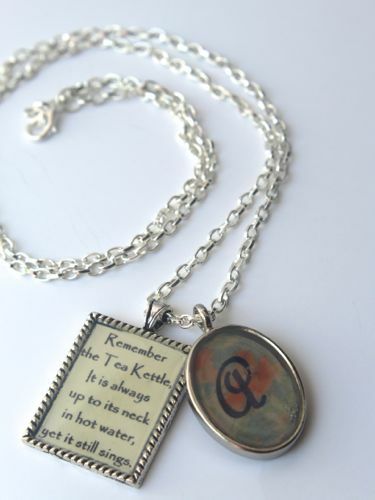 So true … and so lovely to have this in jewelry form! 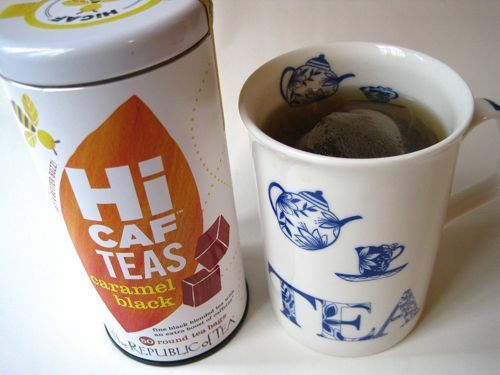 A friend recently shared with me this tin of Republic of Tea's new HiCaf Caramel Black Tea. 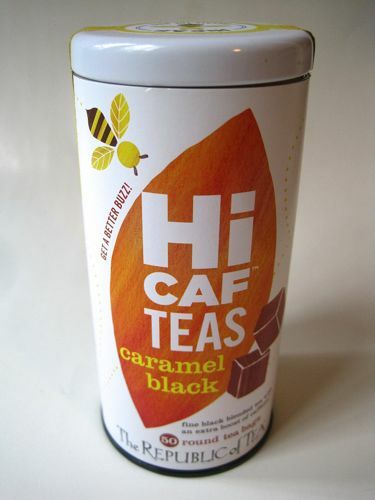 What is HiCaf tea? I'm glad you asked. This one is a "fine black blended tea with an extra boost of caffeine." 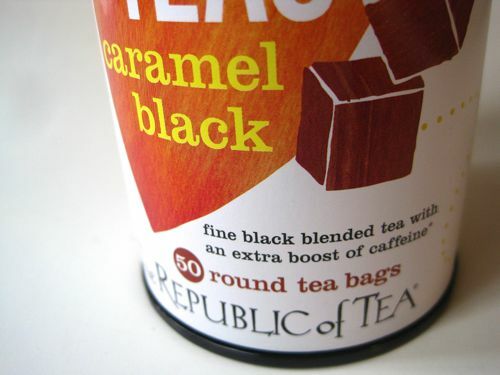 According to ROT's website, a serving of premium black tea usually has 50 mg of caffeine, coffee has 100 mg, and this Caramel Black Tea has 123 mg, more than coffee, which of course is not usually the case with tea. ROT says they have "intensified" the caffeine content of this tea by adding "green tea extract and pure caffeine isolated from premium tea leaves." Caffeine has never been a problem for me, so I was eager to see if the tea would have any effect. I drank it during the day and, to be honest, did not notice I was any more alert than usual. Both *nights* after I drank this tea, however, I felt really wired and I was up till 1 a.m. and 2 a.m. having a creative burst and working on various fiction writing projects. Was the extra caffeine in the tea the reason I couldn't go to sleep? 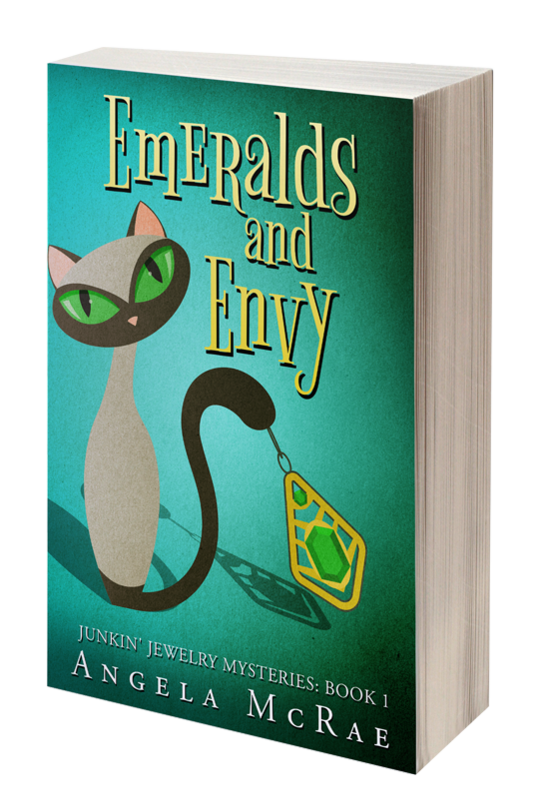 I have no idea, but I can tell you that my first five novels are all coming out next week. (Kidding!) The thing I liked most about the tea, however, is that it has a pleasant caramel taste, so I'm going to keep drinking it—but perhaps a little earlier in the day! 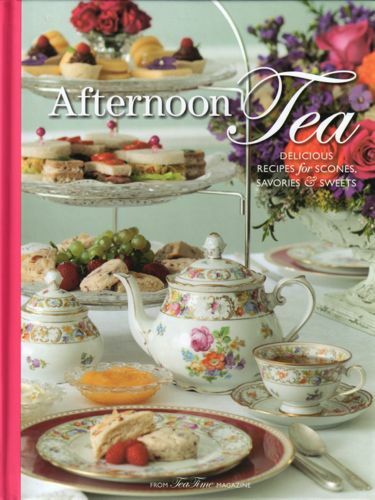 When I was in Kentucky last month, one of the books I bought at the Elmwood Inn Fine Teas shop was this new one from Tea Time Magazine, "Afternoon Tea." 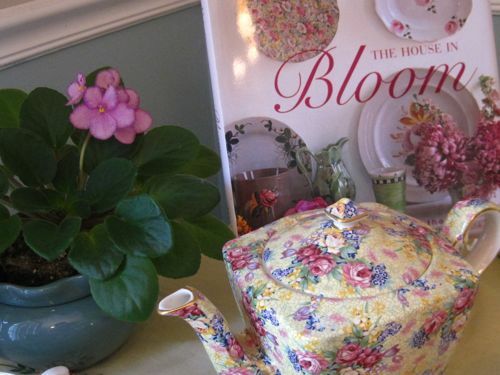 The book came highly recommended by several of my tea friends, so I knew I would like it, and I just got around to looking through it this week. Isn't it amazing how reading a cookbook can make you hungry? 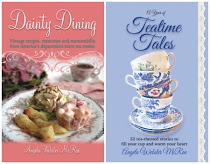 This one has recipes for scones, savories, and sweets, and it features both full menus (Valentine's Day, Mother's Day, Christmas, etc.) 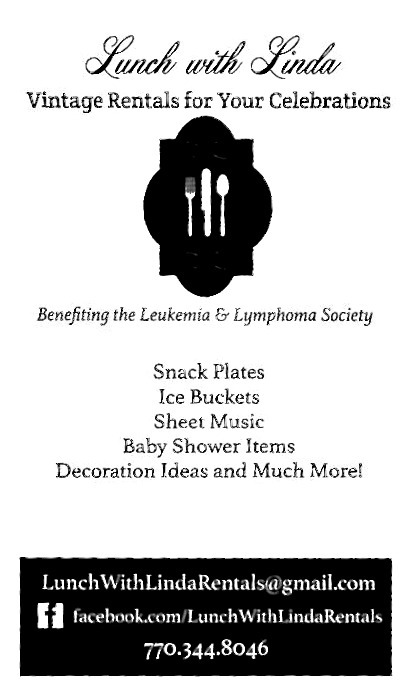 as well as "a la carte" recipes. 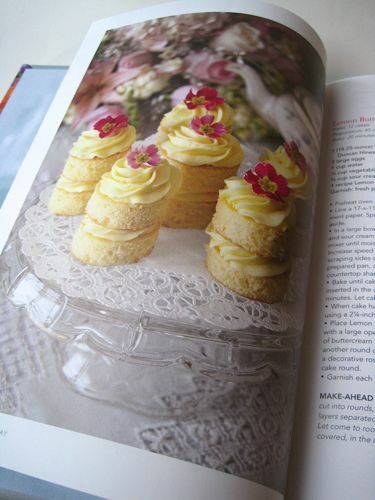 I've had lemons on my mind this week, so I wasn't surprised that one of the dessert recipes that caught my eye was for Lemon Buttercream Cakes. I enjoy *seeing* pretty food almost as much as I enjoy *eating* pretty food, so I appreciate that someone took the time to artfully pipe the icing between the layers as well as on top. 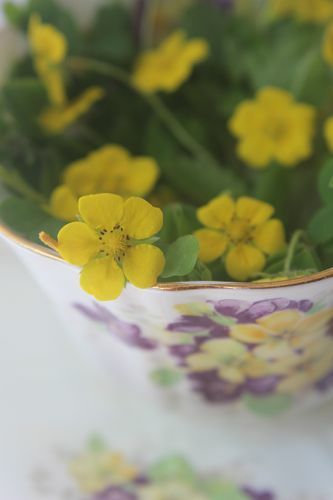 The primrose garnish is a simple and lovely touch. My taste buds must have changed over the years, because today savories, not sweets, are my favorite part of afternoon tea. 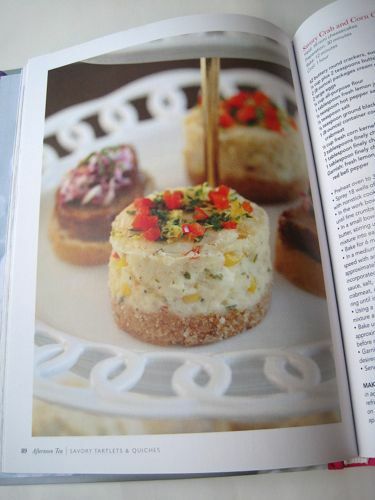 Would you get a gander at this Savory Crab and Corn Cheesecake? Oh. My. Goodness. I love seafood, I love corn, and those chopped peppers and herbs on top must make this simply divine. So just out of curiosity, I'd love to know, what's YOUR favorite part of afternoon tea these days, besides the beverage? Is it the savories, the scones, or the sweets? Oh, and I definitely give a thumbs-up to this great new book for those of you who don't already have it! When the temperatures make it to the high seventies here in Georgia, it's time to start sampling new iced tea flavors. 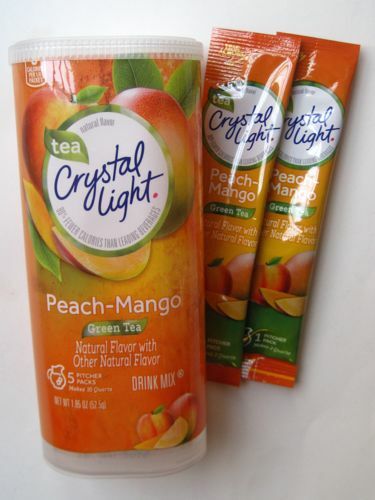 And since I often enjoy those fruity ones you make from a powdered mix, I had to try a new tea flavor I saw at Kroger the other day, Crystal Light's Peach-Mango Green Tea. I love the fruity but not-too-sweet taste of this tea, and it's perfect when I want something nice and cool in the afternoon. I'm used to the single-serve packets of tea mix, but only recently have I seen more of these larger packets, which make two quarts of tea. I'll try any new flavor of tea, so if you happen to spot a new one please let me know! Where has April gone? The month seems to be quickly passing by, and that was a reminder to me that I've been aiming to host a giveaway every month this year. 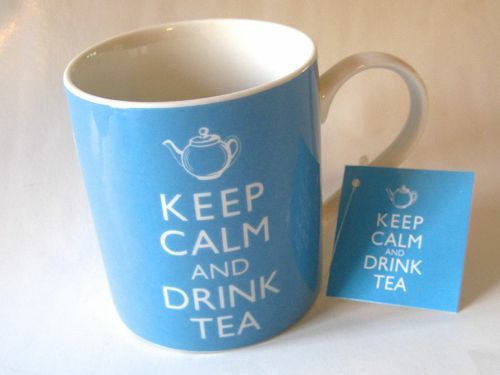 For April's giveaway, I picked up this mug at T.J. Maxx recently since so many of you have commented that you are still fond of the "Keep Calm and ..." items so popular today. The mug still has the little card attached, so if this isn't your cup of you-know-what, feel free to re-gift! 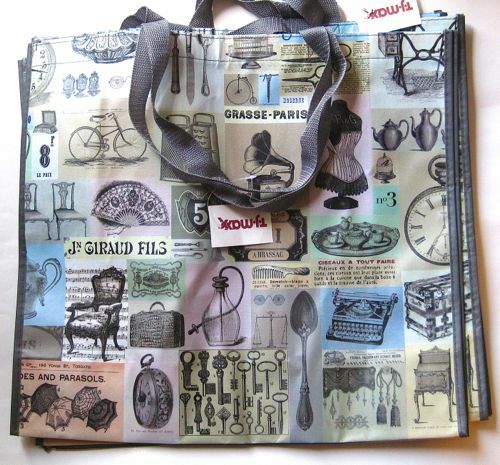 And I'm also going to enclose one of my 99-cent tote bags with vintage teawares in the design, because some of you said you do not live near a T.J. Maxx (oh, the horror!). To be entered, just leave an "Enter me" comment to this post between now and 7 a.m. this Friday, April 25. If you do not have a blog through which I can contact you, please include an e-mail address if you wish to be entered. Giveaway open to residents of U.S. and Canada only. Good luck! 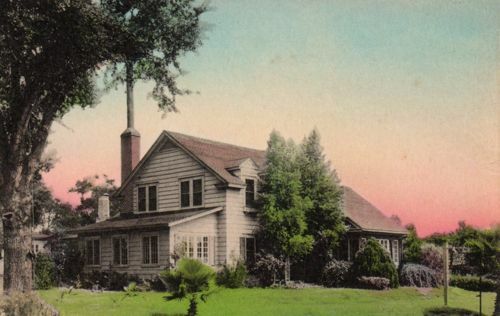 Some of the tea room postcards I have are from grand, busy tea rooms, but this week's featured tea room is the opposite of that, the Little Grey House Tea Room in Maitland, Florida. 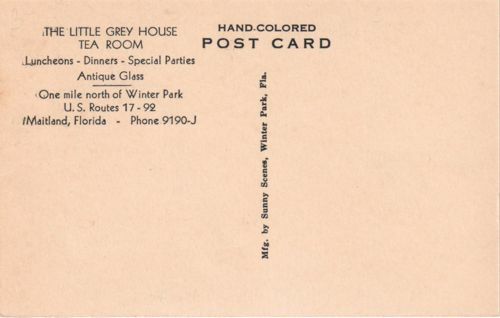 The back of the card notes the tea room was located "One mile north of Winter Park." Apparently the tea room served luncheons, dinners and special parties, and the "Antique Glass" makes me think they might have sold these glasswares. Wouldn't that have been a lovely place to visit? A book was published in 1904 called "The Little Grey House," using the English spelling "grey," and I can't help wondering if that inspired the name of this house and tea room. 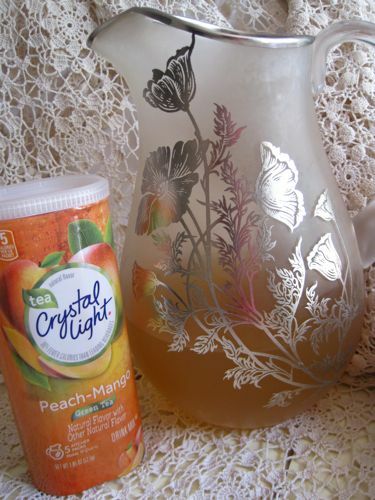 If it were still around today, I'd sure love to stop by for tea and shop for some antique glassware! ... it reveals the postmark is from 1904! 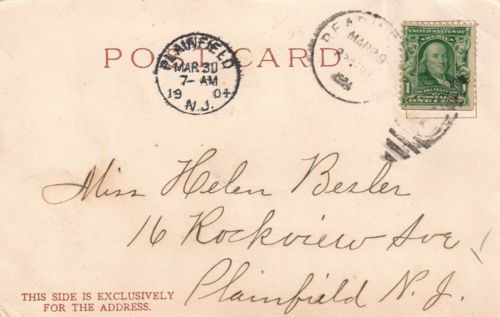 So Helen E. Wells was sending Miss Helen Besler "Fond Easter Wishes" 110 years ago, and I think those sentiments are just as valid today. Happy Easter! Do you have a tea plant? If so, or if you're even thinking about getting one, I highly recommend you get yourself a copy of "Homegrown Tea" by Cassie Liversidge. 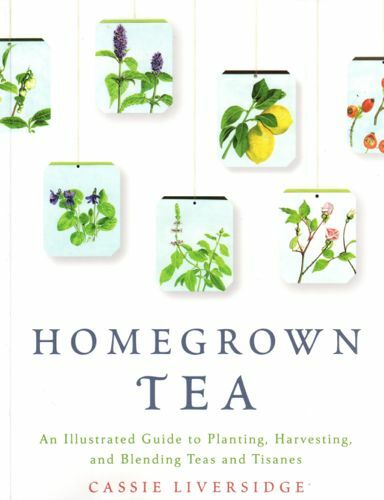 I recently got a review copy in the mail and have found it a wonderfully helpful book, a must-read for the tea-lover who is also a gardening enthusiast. The first pages of the book cover how to grow the tea plant, camellia sinensis, and how to take cuttings, something I'd like to master myself. Once the tea plant is mature, the book tells how to process the leaves at home to create your own white, green and black tea. 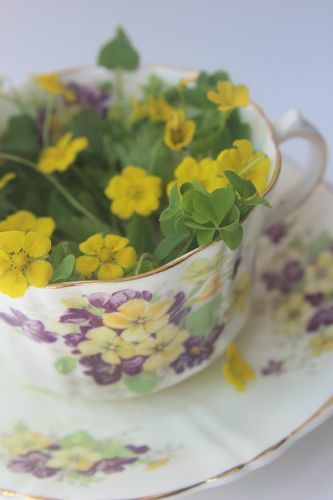 The book also includes chapters on making teas and tisanes from many herbs and flowers. 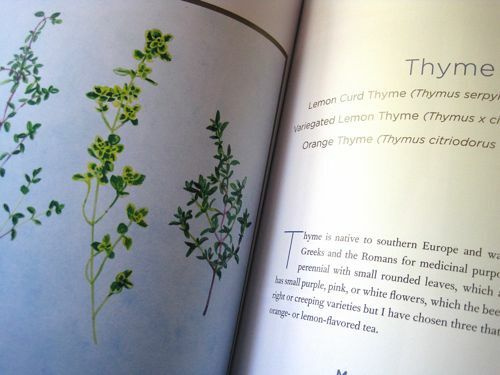 Here is a painting (and the paintings are also by the author) of three kinds of thyme, including one I want simply because of the name: Lemon Curd Thyme! Who knew? 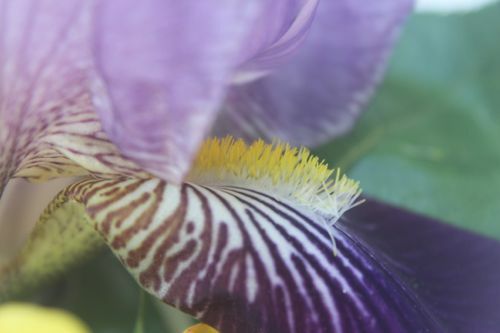 Liversidge describes the medicinal benefits of each plant as well as how to grow it, harvest it, and store the leaves or flowers. 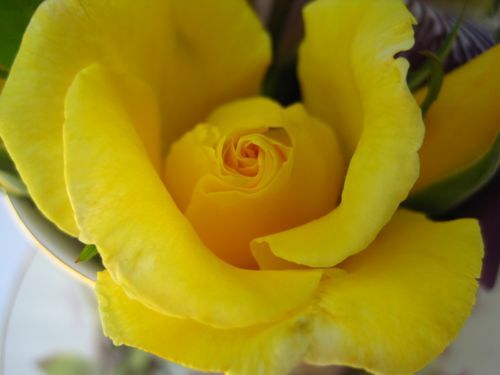 She includes the Latin name of each variety and recommends using it when shopping for plants, because some plants with similar sounding names may not in fact be safe to consume. The fun of reading any gardening book is that I always learn about something new. 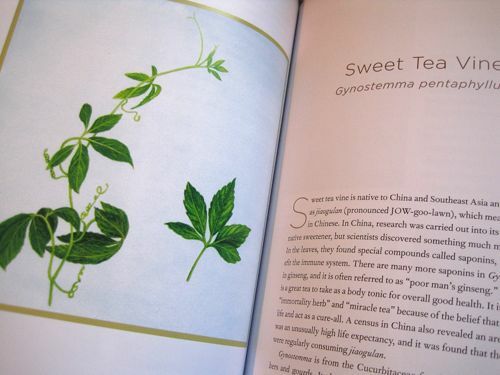 While I learned lots of new things in this book, I was quite surprised that I've never before heard of Sweet Tea Vine. A native of China and Southeast Asia, this plant was studied for its use as an alternative sweetener, but scientists also learned something else. "In the leaves," says Liversidge, "they found special compounds called saponins, known to benefit the immune system. There are many more saponins in Gynostemma (Sweet Tea Vine) than in ginseng, and it is often referred to as 'poor man's ginseng.'" If you're growing your own camellia sinensis or have any interest at all in making your own herbal teas, this is definitely the book to get! 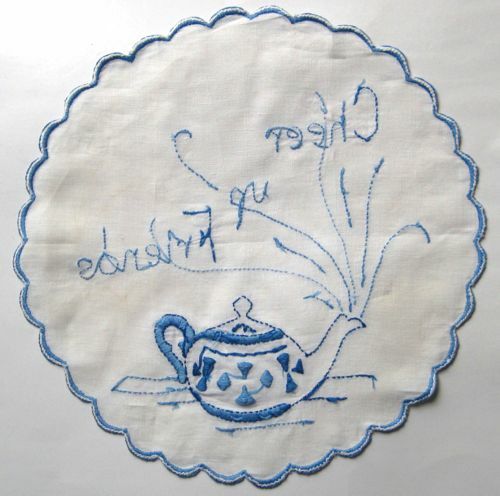 A doily to cheer any tea lover! 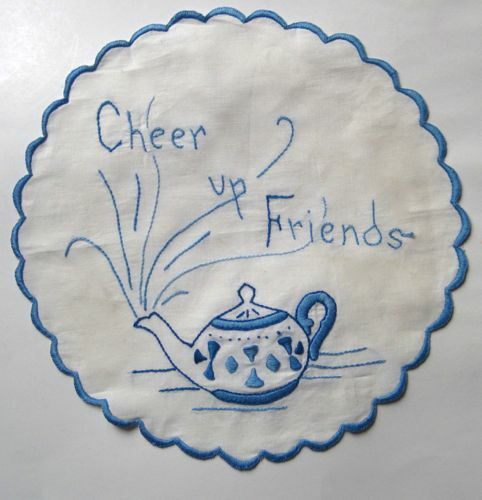 The other day I received this delightful 10-inch doily in the mail from Margie in California. Isn't it pretty? The story of how she got it made me love it even more! Margie writes, "I was shopping in my favorite antique mall and came across this - no price tag so the owner just gave it to me. You like 'blue' so I thought you might like it." Actually, I love it! The embroidery is gorgeous! 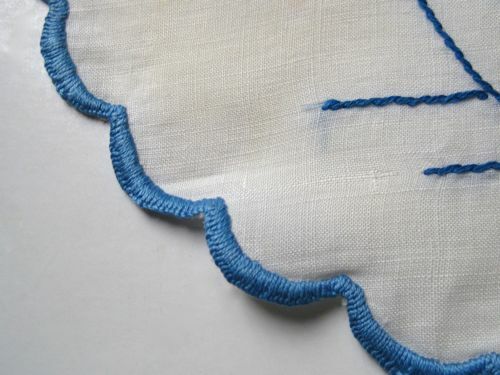 This scalloped edge must have taken forever to stitch. Such meticulous handwork. And even the back of the piece looks immaculate. I love the sweet gift from Margie, and my inner bargain-ista is so impressed to know she got such a darling piece for free! Today is Tax Day, and the only folks I know who get excited about it each year are my accountant friends, who are understandably happy to be winding up this crazy-busy season of the year. Because of the role of tea and taxes in our nation's history, I thought it would be appropriate to fill my cup today with Elmwood Inn's Hyson Green Tea, as this is one of the types of tea that was thrown into Boston Harbor during the Boston Tea Party. The tea tin says, "The three tea ships raided at Boston Harbor are thought to have contained nearly 342 chests of several types of teas, including Bohea, Congou, Souchong, and Hyson." Our protests aren't nearly as colorful today, are they? You know what I've always wondered? After the tea was dumped, did anybody ever scoop up a handful of water from Boston Harbor to see if you could taste the tea? I can't help wondering if it got "cold brewed" there in the harbor. 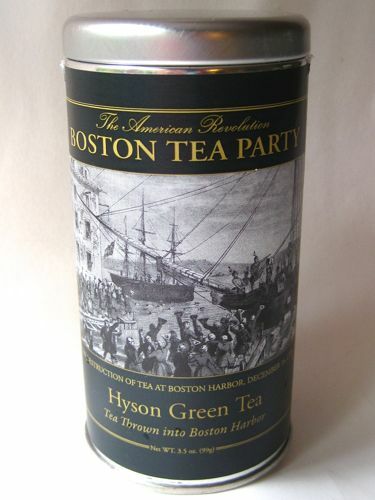 According to Elmwood Inn Fine Teas, at the time of the Boston Tea Party a third of the exported tea from China was green tea, and green Hyson was considered the best. It's the one the Chinese called yu-tsien or "before the rains" tea. From the tin: "The English thought the name of this tea sounded like the name of a wealthy East India Company director in London named Phillip Hyson, and the young tea took on Mr. Hyson's more pronounceable name." Here's what the dry tea leaves look like. The scent is a combination of woodsy and grassy, a very fresh scent. And here it is steeped. These leaves had a very vegetal scent, rather like steamed spinach. The taste was what I consider a classic green tea taste, slightly grassy, and I want to drink more green tea since it's been in the news lately for boosting memory AND burning calories, both of which are great benefits. 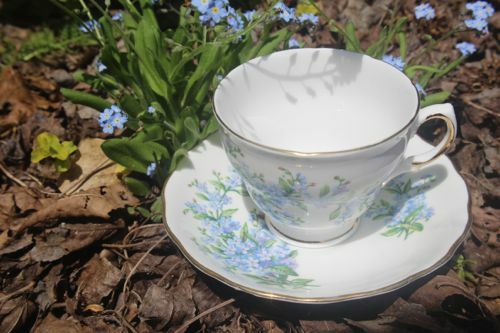 (To keep up with more tea news, I have started regularly posting links to stories of interest to the tea world on Twitter, link at top right, including studies on the medicinal benefits of tea.) 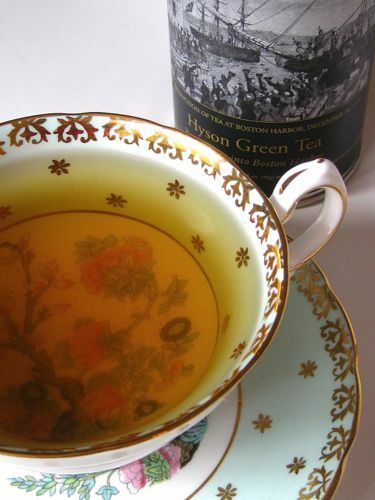 I very much enjoyed this Hyson Green Tea, which is available on the Elmwood Inn Fine Teas site here. Throwing it into your local harbor in protest of taxes is entirely optional. 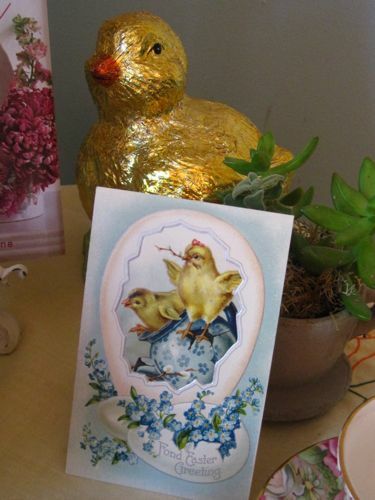 With Easter fast approaching, I thought I'd better get on the ball with displaying a little Easter finery on the tea trolley. I'm pretty sure it was tea blogger Bernideen who influenced me to start changing up my trolley's decor on a regular basis. 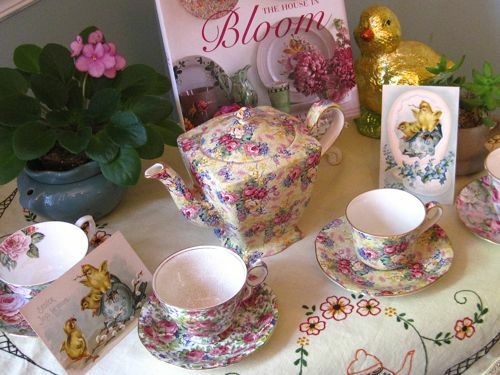 It's sort of like playing with paper dolls, only much more fun, in this tea lover's opinion! 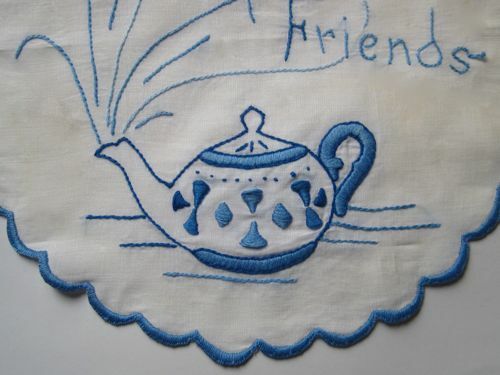 And I KNOW it was Bernideen who influenced me to use my vintage linens more often. 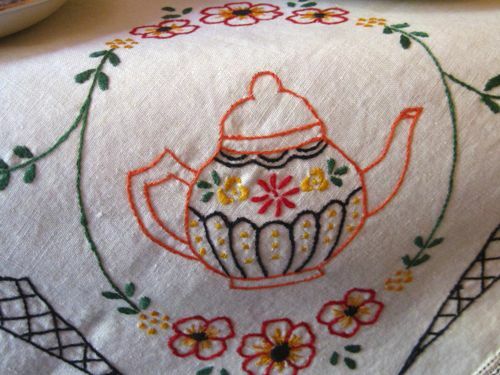 I had actually forgotten I had this vintage yellow tablecloth with teapots on it until I started scavenging around in the linen closet! I love the sunny, cheerful colors of springtime. And I must tell you I am delighted that I have finally coaxed this African violet into blooming again. I just killed another mini violet (pausing for a moment of silence), so I'm extra glad this larger one is still with us. 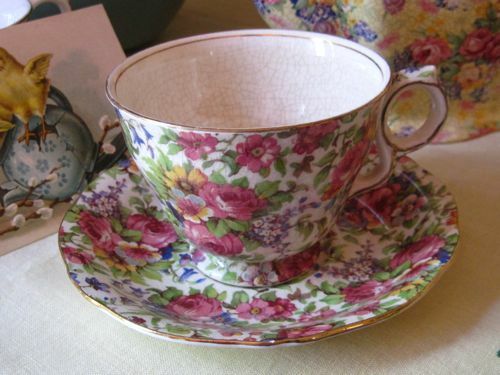 Another Welbeck teacup: this Summertime patterned one. It's old and crackledy and may fall apart one day when I'm using it, but I think it's just lovely. 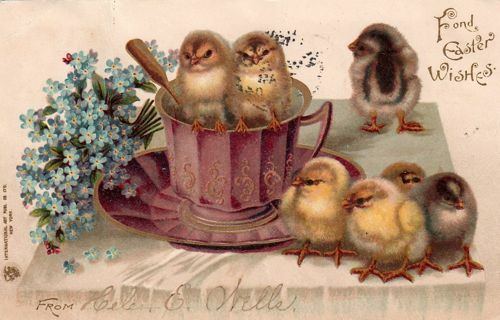 I also used a few of my vintage Easter postcards featuring teapots. 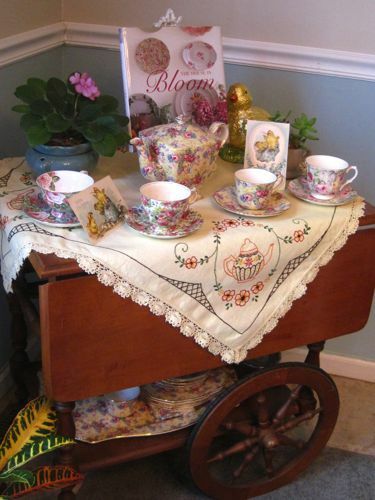 I don't know whether the tea trolley appreciates all the new outfits I've been giving her lately, but they sure make me feel better! A friend is in Tea Time magazine! A giveaway for fans of gluten-free foods!